Michelle strews seed around in gay abandon on her Wycombe plot and, more often than not, plants pop up, just like they should. I try it and Nature descends – mice eating my peas/beans, assorted birds stuffing their beaks with baby leaves or slugs/snails mowing the seedlings off at ground level. Plus my wet, heavy clay takes forever to warm up. So I raise most plants at home or, newly, in my shiny greenhouse which sadly doesn’t have elastic walls. Having the growlights has really helped get this year off to a flying start, but there is a catch. I’ve never before had so many plants at one time. Usually there are 4 trays with 15 bigger plants in each on the windowsill. That’s about my limit. Right now I have those 60 plants, another 60 or so in modules under the lights and the propagator is full. I forgot that seedlings soon outgrow their cute, charming stage. They are getting bigger by the day. 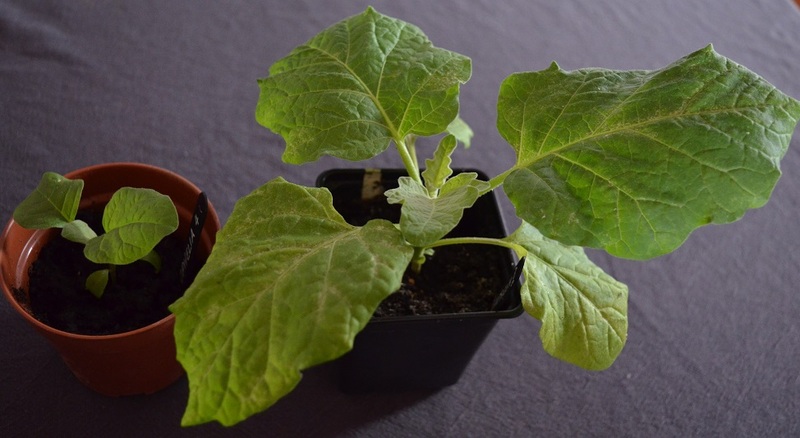 The picture below is of 2 aubergine plants, sown 3 weeks apart. Help! Genius! 😀 Am steeling myself for sowing the 100+ dwarf bean plants I blithely planned at the beginning of the year.